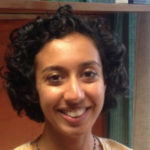 Sangita is broadly interested in the politics and economics of inequality and making services work in India. She grew up in Dallas, Texas, and received a BS from the University of Pennsylvania. After college, Sangita spent several years working in New York in economic consulting but soon became discontent and moved to India where she oversaw a randomized evaluation of a microinsurance program for farmers in Gujarat with the Centre for Microfinance. Sangita holds an MPA in Economics and Public Policy with a Concentration in Urban Policy from Princeton University’s Woodrow Wilson School.